Our plan for greener, electric driving is simple. Create conversion plan for a gasoline car. Find buyers for the car. Get the cars on the road. Start over again with another model. eCars - Now! is an open community devoted to develop high quality electric car conversions available for EVeryone. We want modern electric cars on the road. As quickly as we can, as affordable as we can, and as widely available as we can. Electric Car is ecological, energy efficient and economic, making it a solution for the climate change and oil addiction. And it leaves the ICE cars far behind. 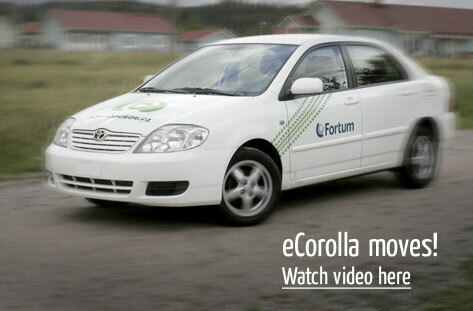 20 May 2011: eCorolla gets registered to road traffic - finally! This is THE major goal the prototype building has aimed since 2008. Now, the goal has been reached. The number of EU directives to pass was more than anybody originally anticipated. 6 January 2010: The Helsinki Electric Motor Show general eCars - Now! presentation available HERE. The publication will be held at Electric Motor Show, Helsinki. Watch live stream 2009-11-6 13:30 EET (UTC+2). Later on that day a global eCars - Now! mini-summit will be held near the expo area. 27 August 2009: eCorolla moves! eCorolla has finally reached a stage where it moves! Call it 0.8 version. Now, the efforts will focus on the finishing the eCorolla into 1.0 version and the BIG TIME publication occasion in Helsinki later this fall. See the "temporary official" eCorolla first run video! 30 July 2009: eCars foundation following the zPrize competition and the nanofundnano projects announced. Your wishes can have an impact on which cars are to be mass converted! ANSWER THE QUESTIONNAIRE HERE. SUBSCRIBE NOW for monthly news package about eCars - Now community. eCars - Now community is participating to EVS24 in Norway with first public exhibition of the eCorolla! 13 Feb 2009: eCars - Now! Goes Global! The global site for eCars - Now! is now open. Some features that we have in our Finnish site are not yet available here, but you can still find lot of information about the project. Slightly unofficial, yet Random EV is the best day-to-day blog of what's really happening in the HC-High-Tech eCorolla project at the garage and beyond. Forum, blogs, howto's etc are coming soon. Meanwhile you can subscribe to our global postlist in Google Groups. Subscribe for monthly newsletter about eCars - Now community. Subscribe for our feed for the latest site changes.